It seems strange to be writing about this as it is a blizzard outside, we went skiing Saturday, and I have been getting e-mail updates for Ultimate Challenge 2016, but alas life is what it is and today I am continuing on with my saga of an event from 2015. . .
Superman was driving, and thought Charcie’s husband was getting pictures, but it turns out he didn’t get as many as we thought. . . There are not many pictures of this event and I learned something new, there are a TON of “Ultimate Challenge” events across the nation. . . who would have guessed? and interestingly enough. . . I had just reconnected with the Velocia group. . . This just so happens to be Becca’s bike! The group took off as I gave Superman anything extra I had in my pockets that was no longer needed or wanted at the moment. It was a comfort to my heart knowing that my support crew was not going to be far off if I needed something. . .
so I got rid of EVERYTHING. . . There was no time to look at my power meter dilemma, the group had left and I needed to catch them, but at least Superman was aware of it. Because he had come up the way I was going down, he warned me of a couple of hazards down the road and off I went. . .
happy that everyone was together. The little Actress was the perfect support as she cheered me on and rang her cow bell. . .
a wonderful sound for a cyclist. She was meeting her Aunt & Uncle in Coalville to spend the weekend with them, and I missed her bright smiling face when she was no longer with us for this journey of endurance. Heidi is a strong rider, stronger than any one of our group and ended up forging ahead of us. I attempted to keep up but simply couldn’t hang, but was glad she did go ahead, it would have been a long miserable day for her had she stuck with us at our pace. . .
so now our group was down to five. The morning was cold, especially the descent. As I caught up with the group and forged ahead with temps that felt somewhere around the low to mid 50’s, and as we went up and around East Canyon Dam, the air was humid, misty, wet, and cold. My glasses quickly became unusable as the mist covered them in water making it so I couldn’t see, at all. I ended up taking them off. and I was beginning to think that I was going to have to wear my leggings and arm warmers the entire day. We were working together, sort of. . .
as we progressed forward the differing opinions on how we should be approaching the challenges of this ride were consistently cropping up and were hindering our effectiveness. . .
communication was a HUGE problem. training rides as a group are a critical component when desiring to ride as a team so we would be cohesive and unified. We didn’t have the “thinking as one” and had we done group rides, the discussion and debates we were having, would have been eliminated as the experimenting that was happening as we tested various theories as a group, would have already been figured out. Often times, hindsight is a difficult lesson to swallow.
. . . these problems are the things we will iron out before LOTOJA. As we approached Henefer, I was finally able to shed the arm warmers and leggings, as the day was finally beginning to warm up. This was the second aid station and our support was waiting for us with water, nutrition and bike repairs. Here was another major hindrance in our group. I was a little surprised and a bit confused when our support wasn’t at the designated rest stop, but figured we would find them soon, so I wasn’t to terribly concerned as Superman had everything I needed on board. Becca, however, was planning to use the actual support provided at the rest stops by the Ultimate Challenge Peeps but Kim and Kathy had their support crew stop a couple of miles from the designated support stops, leaving Becca in kind of a bind for nutrition, and no potties either. We, at least I was unaware of her concern and frustration at the immediate moment, it wasn’t until the next stop that she brought it up. we had plenty of water, and extra nutrition but the situation wasn’t sitting well with her. it certainly wasn’t what Becca was planning. As we approached the Green Goblin, I saw that Superman had my wheel and was putting on one of our tires so I could return Charcie’s wheel to her bike, and Becca’s tire to her completely unused. but I was annoyed now. Did I mention how frustrating this was becoming. . .
and I or Superman were powerless to fix it. the need to keep moving was critical, it was important to get to Coalville by 9:30 am to avoid a detour around their city parade. This was also a major marker for how we were for time. This point is a critical assessment to whether we were on track to finish on time. As we approached Coalville at 9:26 I shouted my hallelujahs and waved to the city peeps as they watched us ride through their town, waiting for their city parade to begin. We made it and my heart soared with encouragement. . . I found myself relishing in the fact that the streets were lined on both sides with townsfolk there watching us ride by and sort of cheering us on while they waited for their town parade to begin. but we were doing okay!
. . . and the wind. Our little group was managing to do okay, but the wind was costing us dearly. It was going to be close as it was, but the wind certainly was not helping our cause. We were passed by many riders but we were steadily moving forward and I was feeling good about our overall performance. knowing that we were well ahead of where I was two years ago at this point and I was confident we were going to finish. 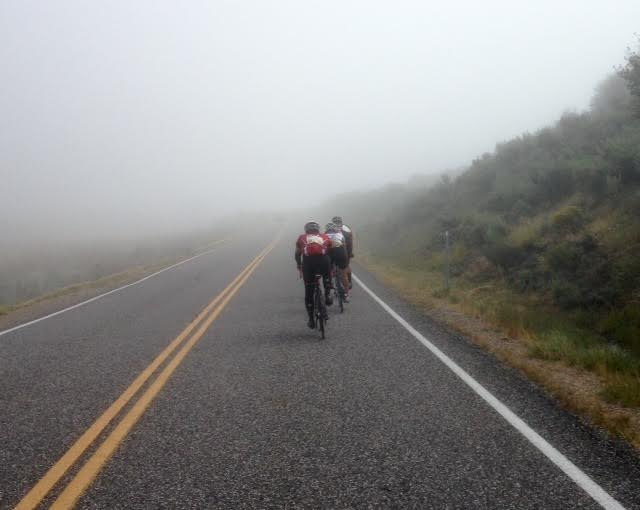 we still had 10,000 ft to climb, and 50 miles of pedaling left. The wind was slowing me down, no doubt, but as a group we were getting it done. My only recourse was to hunker down and move forward. Forging ahead taking 2 min pulls each, this strategy saved me from blowing up. it made me look charitable. . .
said we would be close to finishing on time. approached The climbs out of Park City. a prayer in my heart I continued forward. but now it was devastating. This is where I saw my coach and his son, riding tandem. He slowed enough for me to catch up with them and talk for a couple of minutes. . . before plowing ahead effortlessly, like I was stopped along the side of the road. It was a good moment, he said we were doing well and was happy for me. After the ride, he later confessed that he didn’t think we would make it, but was pleased and glad that I did. A great coach doesn’t deliver devastating predictions while suffering in the thick of a fight. . . He was pleasantly surprised at my finishing report . and it was taking it’s toll. This is where I recognized the blessing of a blown tire that morning. I was riding so well, so strong, that I very likely would have done what Heidi had done and gone ahead of the group on my own, then when I hit this wind to battle it out on my own, it would have destroyed me. It would have been here, at this point in the ride the group would have caught up to me and I may not have been able to keep up, besides I would have felt odd by picking up with them at this point after ditching them in the beginning. That flat allowed me to charge up immigration and Big Mountain and realize I needed to reel it in and stay with the group. This is where I am once again grateful for a Heavenly Father who knows my needs before I do and intervenes with setbacks to help me, while still allowing me to succeed. Without dispute, the most difficult part of the ride was ahead. . . I began to back off a little so I would have enough strength to face what was coming. and it was coming soon. yet, less than 1/4 of the climbing was done. Charcie, is professional photographer ~ aka: Milestone Photography. . .
her camera shows the difference. . .
Brown’s Canyon is something people talk about as being big and hard, but it’s not a big deal . . . kind of like Sardine Canyon from Logan to Brigham, a relatively easy ride . unless, like today we rode into a relentless headwind!
. . . for most of the ride to this point. Superman and Dion (Charcie’s Husband) were waiting for us at the summit of Browns Canyon. This section is typically hot and dry and I have always desperately needed hydration at the summit, so Superman was there. Today, temperatures were mild, but the wind more than made up for the lacking heat. We fueled up, and tanked up on water before heading off again. I ate a wrap and offered one to Becca who was excessively grateful for the nutrition, it quickly became unanimous that turkey and cheese wraps smothered in Best Foods Mayo and Sweet Baby Ray’s mustard sauce was the new GOTTA HAVE IT food for a long demanding ride. they were absolutely delicious and our bodies drank the nutrition instantly! Wasting no time we quickly got going again, and as we rounded the corner to Park City, The thought was a little overwhelming to think about approaching the toughest part of the day. but it was reality. . . The wind was still relentless, but I mentally focused on nutrition and final preparation that would get me over the top of Gaurdsman. This time we did stop at the designated rest stop. This fared well for Becca and they had ample potties. . .
and a wish of good luck and encouragement from our support. Kim and Kathy, as was their routine, stopped a short distance from us away from the feed zone, We weren’t sure where they were, and when the three of us were ready we headed off, watching for where they were stopped. As we approached them they had determined they weren’t going to finish in time. Taking into consideration that Kathy was struggling with an injury, she and Kim decided to end their ride in Park City. We didn’t stop to convince them otherwise, it was imperative we keep moving. Now there were only three of us together. As I stated earlier, we ride quite a lot together. We saw Corkey at this juncture, always a highlight for me. Corkey is from Cache Valley who rides with us a group. He drives one of the support/transport vans for the BMC Pro team and he always slows down and pauses for a moment to say hello and offer words of encouragement. . .
his cheering us on truly gave me a boost. We rounded the assisted intersection. . .
. . . I ride for those moments! We arrived at the point where I crumbled two years ago. . .
my heart was encouraged, while my legs were fatigued, they still felt okay and I was pedaling strong, but experience is humbling and frightening, and I fought to push out past performances from my mind as I kept my focus on today. We reached Marsac and I was still going. I wasn’t dying, no walk of shame. I had pre-determined that I was NOT going to walk any portion of this ride.
. . . I was still going. I was now beyond the point where two years ago the pros came through. I was encouraged and kept pedaling, grinding the pedals around and around slowly but I was going up this insane mountain and that was all that mattered at this point. I made it to the first turn up the switch back and then more 14% grades. the fact that I was pulling it off was exhilarating! I was doing it and was getting excited. As we climbed this mountain, we didn’t know for sure where we were at individually, as an unwritten or expressed policy, the goal was to survive, knowing full well that stopping unnecessarily, or going too slow waiting for someone else could prove fatal, going to fast, would be suicide. We simply knew that we needed to surmount this hill, and that we supported each other as we all worked independently toward the same goal of . . .
We weren’t sure where Charcie was, as Becca and I were riding together and she needed to stop for just a second to adjust her wickie (headband) that had ridden up under her helmet, and the sweat was running into her eyes, a very uncomfortable, if not painful situation. . .
We stopped at a flat section which read 5% grade. after climbing 10% – 14% for over 1 1/2 hours. We quickly resumed riding and reached the second round-a-bout that went up to the summit of Empire Road. By now, I had determined that we wouldn’t make it to the finish line before the pros, and going up this road at a painfully slow pace of 4-5 mph gave me plenty of time to think of a plan.
. . . she was hesitant. Thanks for stopping in, the next post will finish my report of this ride. I will look forward to seeing you next week!